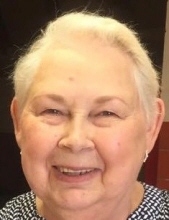 Mary I. Uppena, age 77, of Potosi, passed away peacefully on Friday, April 5, 2019, at Edenbrook of Platteville. She was born on September 21, 1941, in Monticello, IA, the daughter of Raymond and Ardella (Koch) Staner. Mary graduated from Clinton High School in Clinton, IA. She married Robert Wayne Hayward and together they raised four children. He preceded her in death in 1994. Mary owned and operated Mary's Crafts in Maquoketa, IA. She later worked as a floral designer at Ben Franklin and Piggly Wiggly, and most recently was the manager of River Roads Country Crafts in Potosi. On July 3, 2004, Mary married William "Bill" Uppena at St. Andrew Catholic Church in Tennyson, WI. She adored her husband, children, grandchildren and great-grandchildren. Mary loved to decorate for Christmas and Easter. She was a member of the Lion's Club and took pride in organizing many of their activities, her favorite being the Easter Egg Hunt. Survivors include her loving husband, William "Bill" Uppena; children: Robert Wayne (Tina) Hayward, Jr.; Michael Lee (Christine) Hayward; Lisa Marie (Blaine) Waknitz; Linda Rae (Rick Andrews) Hayward; Steven William (Jennifer) Uppena; 10 grandchildren; 14 great-grandchildren; her sisters-in-law, Lois and Eileen Staner; other relatives and many friends. In addition to her parents and her first husband, Robert, Mary was preceded in death by her siblings Raymond Staner, Jr. in infancy, John and Harold James "Butch" Staner. A Mass of Christian Burial will be held on Saturday, May 11, 2019, at 11:00 a.m. at St. Andrew Catholic Church in Tennyson with Father Richard Leffler officiating. Burial will be at a later date. Family and friends may call on Saturday from 10:00 a.m. until time of services at the church and after the services from 12:00 noon until 3:00 p.m. at SS Andrew Thomas School in Tennyson, where a Celebration of Life will be held. Martin Schwartz Funeral Home & Crematory in Potosi is entrusted with her care. To plant a tree in memory of Mary I. Uppena, please visit our Tribute Store. "Email Address" would like to share the life celebration of Mary I. Uppena. Click on the "link" to go to share a favorite memory or leave a condolence message for the family.